You'll receive this task from Imatl in Ondra's Gift (#1). Imatl will tell you that his ship crashed into the reef near the docks, and that an Engwithan Scepter washed out to sea -- or so he thought, until a local fisherman found one of the pieces of it and gave it to him. Now Imatl will surmise that all of the pieces might be nearby, and he'll ask you to look for them. 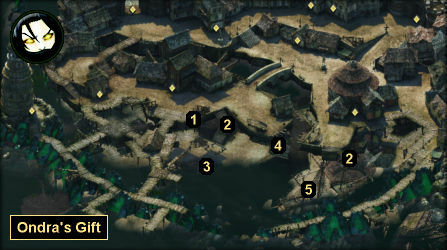 You'll find the three missing pieces of the scepter in the shallow water near the docks (#3-5). To enter the water, you'll have to climb down one of the two ramps in the district (#2), which you'll only be able to do during low tide. Low tide lasts from 6 AM to 6 PM. You might need to exit and re-enter the map to get the tide to switch from high to low. While you're searching the water, you'll run into some Animats and Rain Blights, but you shouldn't have too much trouble defeating them and picking up the three scepter pieces. When you show the pieces to Imatl, he'll try to make you a deal. He'll offer you his piece, plus the name of an animancer who will buy the set, for a mere 200 cp. If you make him feel guilty about surviving when the rest of his crew died, he'll lower the price to 100 cp. You can also use the Might 14 or Dexterity 14 dialogue option to get his piece of the scepter for free, but this will cost you a "moderate" amount of reputation with Defiance Bay. Regardless, you'll end up with a Runic Engwithan Relic, and you'll learn that Nans in the Sanitarium in Brackenbury is interested in Engwithan artifacts. When you show Nans your collection of scepter pieces, she'll offer you 500 cp for it. If you have Lore 4 or Perception 14, then you'll recognize that she's shortchanging you, which will allow you to increase the price to 700 cp or hire her to reassemble the Engwithan Scepter for 1800 cp. With Resolve 13, you'll be able to reduce the reassembly price to 1500 cp.